One year ago, Canadian Prime Minister Justin Trudeau told a press conference that it was “theoretically possible” for his country to take back 103 container vans of noxious garbage illegally shipped to the Philippines in 2013. On the sidelines of the 31st ASEAN Summit at that time, Mr. Trudeau said regulations in Canada that had prevented it from taking back the shipment had been cleared away, making it theoretically possible for Ottawa to remove a “longstanding irritant” in its relations with Manila. He also said his government would continue working to resolve the problem—but offered no guarantees that the Canadians would indeed take back their garbage. He also observed at the time that the shipment began as a private commercial transaction and did not involve the two governments, and as such, the two sides would still have to determine who would pay for the shipment back to Canada. 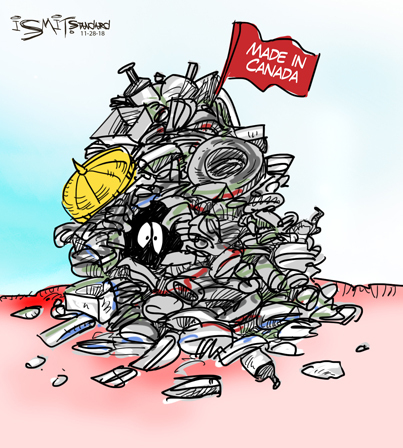 A year has passed and Mr. Trudeau’s reassuring words to Filipinos remain meaningless, as neither he nor his government has done anything to take back the tons of plastic bottles, plastic bags, household garbage, and used adult diapers illegally shipped to Manila by a private Canadian company. “Relevant authorities of Korea will have the wastes in question… repatriated and properly disposed of and work to prevent recurrence of the problem,” a statement from the South Korean embassy said. South Korea’s Ministry of Environment initiated on Nov. 21 legal proceedings to have the waste brought back in accordance with their laws, the statement added. What’s more, South Korea’s Ministry of Environment, Korea Customs Service, and Ministry of Foreign Affairs have begun investigating the Korean exporter involved in the controversial shipment. Nor did South Korea equivocate about who would pick up the bill for the shipment back, or make an issue of the private nature of the transaction. The message was clear—an environmental wrong had been committed and South Korea promised to make it right. While we have yet to see these efforts bear fruit, the South Korean commitment to take prompt action—particularly in comparison to Mr. Trudeau’s hemming and hawing—is laudable. It isn’t too late for Mr. Trudeau and the Canadians to do the right thing. Take their garbage back.